The Falloff Lighting plugin for After Effects provides a lighting system that mimics the way objects appear dimmer the further away they are from the lights illuminating them. With After Effects’ built-in lights, it doesn’t matter how far away a layer is from a light, it is still illuminated the same amount by that light. Distance Scale: Because the plugin doesn’t know the scale of objects in your scene (are they in centimetres, inches, feet? ), you can adjust the Distance Scale parameter to account for this. Higher values will cause objects that are farther away from lights to be illuminated, whereas lower values will cause only nearby objects to get illuminated. Natural(1/r2): The intensity of light reflecting off of an object is inversely proportional to the square of the distance of that object from the light. When you set the Falloff Type parameter to “Natural,” it uses that model for calculations. Distance(1/r): Sometimes you want to use a different method to get a different look. Setting this parameter to “Distance” will give a much more gradual falloff as the distance from the light increases. 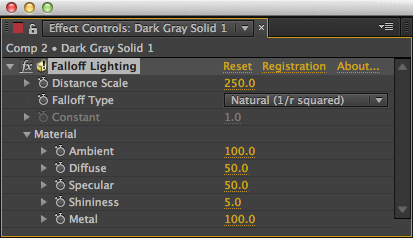 Constant: Setting it to “Constant” will provide behaviour similar to After Effects’ built-in light- ing. However, you can increase or decrease the constant for different looks. The “Constant” setting is also useful as a way to check that all your layers are in the proper place after making changes. You can then set it back to “Natural” or “Distance” for your final render. 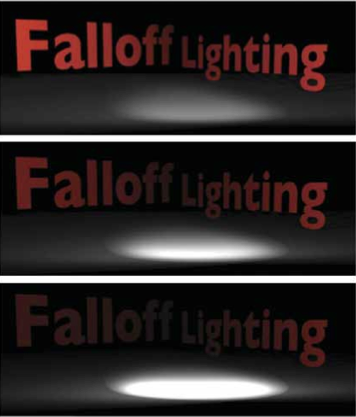 When the Falloff Type is set to “Constant,” this value controls how lights are weighted. A value of 1.0 produces results similar to After Effects’ built-in settings. Larger values produce brighter results, while smaller values produce darker results. When you apply the Falloff Lighting effect using the command from the Composition menu, a Master Falloff Lighting layer will appear at the top of your layers in the Timeline. All the lay- ers below this Master Falloff Lighting layer will inherit the same Falloff Lighting effect. You’ll notice that all of your 3D layers have their “Accepts Lighting” flag turned off. This allows only the lighting applied by the Falloff Lighting plugin to show, and not the default lighting. You can still change the material properties of the layer and the Falloff Lighting plugin will render them correctly. For example, specular highlights still work the way you expect, as do shadows and light transmission. If you add layers after you’ve applied Falloff Lighting using the Composition menu, and the new layer appears above the Master layer, you can apply the same Falloff Lighting effect to these new layers by dragging them to a slot below the Master layer. Choose “Apply Falloff Lighting To All Layers” again from the “Composition” menu, and layers that already have it applied will be left alone, while any new layers will have it applied correctly. Alternatively, apply the Falloff Lighting plugin with different parameters to the new 3D layers for different effects. Note: if you apply Falloff Lighting to layers using the Composition menu method, you should not have applied Falloff Lighting to any of the layers before. If you do, the “Accepts Lighting” flag will not be turned off, creating unexpected results.